YORKVILLE, Ohio, Dec. 8, 2015 /Christian Newswire/ -- The Chrisagis Brothers have always been two guys that don't let grass grow under their feet. They work hard to bring clean family entertainment and great ministry filled with love to the world. Their Christmas Concert for the Tri-State area where they live are staples in the area with the biggest and brightest Christian Music Artists coming in to minister from the heart with the brothers. 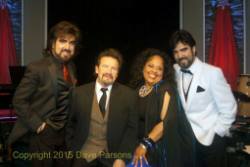 This years concert includes six time Grammy winner and 18 time Dove Award winner Russ Taff, who is shown in the photo with the musical duo and the beautiful anointed songbird and international music star Angela Primm from the Gaithers Homecoming shows. Russ Taff was a hero to the brothers growing up and now he's like family to them. The four artists gave one of the sweetest concerts with laughter, tears, and a powerful message unlike concerts today. It was a touching concert filled with the Spirit of God and a few fun skits giving tribute to the legendary artist Russ Taff. Plus songs and a dance number with Primm that brought the love of Christmas to all. Ending the night was a powerful worship section that had everyone in tears, hugging and holding hands. Next for the Chrisagis duo are three Christmas Concerts with the First Lady of Jesus Music Nancy Honeytree. On Saturday, Dec. 12th at 6:30 pm The Chrisagis Brothers and Nancy Honeytree will be ministering in music, word, and Christmas favorites at the Paris Presbyterian Church at 127 Steubenville, Pike Burgettstown, PA 15021. It's become an annual tradition for Paris Presbyterian to host the Brothers. Sunday, Dec. 13th the Brothers and Honeytree will be together again for a Christmas Concert during the morning service at 11:00 a.m. at Wintersville Community Chapel, 27 Ward Drive Wintersville, Ohio 43953. They will perform again that night at 7:00 p.m. at St. Joseph the Worker Catholic Church, 229 California Ave., Weirton, WV 26062. To understand the great honor the Brothers feel to have Nancy Honeytree with them you need to understand the great legacy of Honeytree and her music ministry to the world. Nancy Honeytree was one of a group of classic artists like Keith Green, Larry Norman, Phil Keaggy and Chuck Girard who brought in a new sound to church music that was never heard of before. Honeytree was one of very few women active in contemporary Christian music at this early stage, and she is regarded as a CCM pioneer and honored as the First Lady of Jesus Music. Her LP "Evergreen" is noted as one of the top selling Christian LP's of all time. The LP is rated as the top 100 best in CCM history.